v1b3 (Video In the Built Environment) is an international curatorial project that aims to present video art that responds to the conditions of site specificity and a public viewer-ship. Urban planners and architects are used to shaping cities by means of infrastructure, zoning and buildings. However, other modes of intervention exist that are capable of influencing the development of a city. Communicative media interventions can transform public spaces. 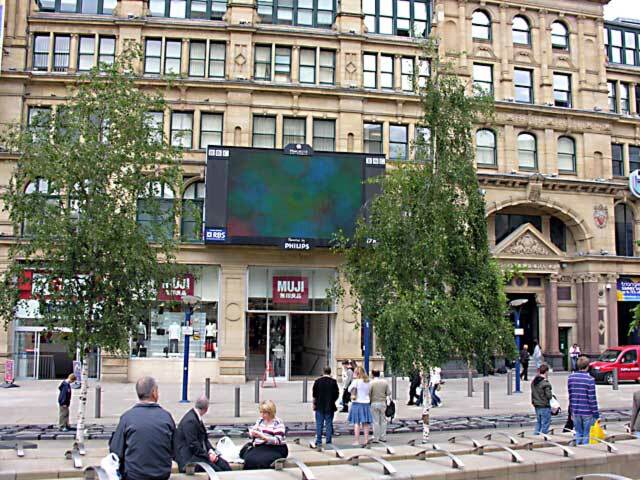 v1b3 Manchester will be shown on the Big Screen, a 25 square meter video screen, located in Exchange Square. VIBE Manchester will be presented in association with iDMAa, the International Digital Media and Arts Association. The screenings will occur during the iDMAa conference [March 16th-18th] in Orlando, Florida, USA. In addition, there will be a panel discussion about the VIBE project and panel participants will be located at the conference as well as in Manchester, UK interacting through video conferencing technology. VIBE Manchester will have a companion DVD developed for publication and purchase. The Bigger Picture is a Cornerhouse project with responsibility for programming and coordinating moving image art work on a 25 square metre Big Screen in Exchange Square, Manchester. context, and forms a platform for short films, video art and community moving image. Big Screens are now being established in cities across the UK. But the Manchester version was the first and the curatorial role of Cornerhouse is unique. Established in October 2003, The Bigger Picture has put art at the centre of Big Screen programming and continues to experiment with emerging video work to engage and enthrall in an urban environment. Initiating collective moments in public space, it offers artists and filmmakers the opportunity to reach a diverse audience who encounter the work as part of their movement through the city. Exchange Square webcam with still photos refreshed every five minutes,here. The International Digital Media & Arts Association (iDMAa) is all about the convergence of people, ideas, disciplines, technologies and progress. iDMAa is a forum for professionals working across the wide range of disciplines and initiatives that are clustered around the emerging field of Digital Media and Arts. Traditional disciplines including the Arts, Computer Science, Engineering, Journalism and Communications, Media Studies, Film and Television, and many others are embroiled in sweeping changes wrought by new technologies, new applications, and new challenges. Colleges and universities are attempting to incorporate these new technologies and practices into their curricula, with varying results. Industry practitioners are also affected by the rapid proliferation ofnew media, but traditional trade associations do not offer sufficient interdisciplinary depth for creative individuals whose work cuts across boundaries. iDMAa is a forum where progressive thinkers and creators can come together as a community — both online and in person — to share insights, concerns and experiences related to their common interests. Arts Magnet helps arts/cultural organisations and artists make the most of the emerging digital world we and our audiences now live in. By supporting collaborative partnerships between traditional and new media art forms, Arts Magnet encourages all art forms to consider what core parts of their practice can be made digitally interactive, in order to intrigue, excite and engage the new and young audiences of this century! Arts Magnet exists to skill up the arts sector in digital audience development, offering practical help with: making rich digital content and event listings for different digital channels and devices; training; syndicating digital content; and developing e-business models.